Japan's space agency (Jaxa) has put another lander on the surface of asteroid 162173, or Ryugu. The Hayabusa-2 probe ejected the German-French Mascot "rover" on Wednesday for its 20-minute journey down to the space rock. Hayabusa-2 reached the asteroid in June this year after a three-and-a-half-year journey. On 21 September, Jaxa celebrated a first, as the probe successfully put two small (18 cm wide) robot explorers on the surface. 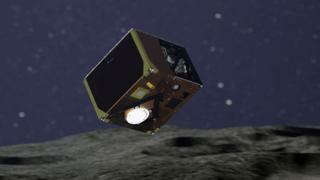 Now, the Mobile Asteroid Surface Scout (Mascot), which has been built by the German Aerospace Center (DLR) and the French Space Agency (Cnes), has repeated the feat. DLR said there was huge relief in the Mascot Control Centre that everything had proceeded according to plan. Images acquired by Mascot during the descent have been uploaded to Hayabusa. "It could not have gone better," explained project manager Tra-Mi Ho from the DLR Institute of Space Systems. "From the lander's telemetry, we were able to see that it separated from the mothercraft, and made contact with the asteroid surface approximately 20 minutes later." Hayabusa-2 had spent Tuesday reducing its altitude from its "home position" some 20km above the asteroid. When it got to an altitude of 51m from Ryugu's surface, the probe let the Mascot go to drift further down under the gentle pull of the 900-wide asteroid. "The gravity is so low that Mascot more or less flies down, similarly to a piece of paper falling on to a table from a height of 30cm," explained Mascot's principal investigator, Dr Ralf Jaumann, just before the release. The 9.6kg (21lbs) science package has now begun its investigation of the asteroid surface. Mascot will study Ryugu's mineral make-up, temperature and magnetic characteristics. Mascot has a swing arm inside to generate a torque that will throw the lander to a new location. The lander's payload consists of four science instruments: an infrared microscope called MicrOmega, a camera called MASCAM, a radiometer for measuring the power of electromagnetic radiation (MARA), and a magnetometer to measure magnetic forces (MASMAG). "The goal is to really understand the asteroid," said Christian Krause, the operations manager for Mascot. "Understanding how everything here formed - our Earth and the other planets. This is what we are trying to investigate." Dr Jaumann added: "The question of where the water on Earth originates hasn't really been answered yet." We know that asteroids contain water today. Some scientists think that both asteroids and comets could have delivered water to Earth in the early days of the Solar System, when they collided with our planet. Hayabusa-2 was launched from the Tanegashima Launch Center in far southern Japan on 3 December 2014. It has been carrying a number of instrument payloads for release on to the surface of its target, Ryugu. On 21 September, it released two robot rovers on to Ryugu, which quickly returned images and the first video ever sent from the surface of an asteroid. In late October, the spacecraft will descend to the surface to collect a sample of rock and soil. Even further into the mission, Jaxa plans to detonate an explosive charge that will punch a crater in Ryugu. Hayabusa-2 would then descend into this crater to collect fresh rocks that have not been altered by aeons of exposure to the environment of space. The plan is to bring these samples back to Earth for laboratory study.